This issue marks the conclusion of EIKON’s 25th anniversary, which we heralded with the special publication of 5 x 5. Photo Tracks this summer. In the five-volume compendium, David Bate, Linde B. Lehtinen, Steffen Siegel, Abigail Solomon-Godeau, and Urs Stahel distilled the (potential) essence of all our previous publications. This view from the outside simultaneously carved out five themes that were relevant for photography in the past twenty-five years and outlined them on the basis of altogether twenty-five artistic positions. We were able to present the result of this ambitious endeavor, packaged as a 200-page essay collection, in the course of our anniversary party on June 28, 2016 at the MuseumsQuartier in Vienna, where many of you came to celebrate with us (p. 12–15). 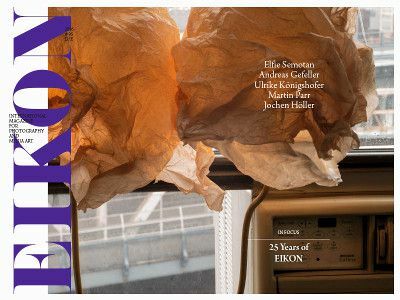 The very first issue of EIKON – International Magazine for Photography and Media Art was published at the end of 1991. In 2016, a quarter century later, the fine art scene at the time and especially the increasing relevance of photography as an artistic medium (as well as the media-theoretical debates it triggered) may only be a hazy memory for some readers. Similarly, an ever-shrinking number of the people involved in the production process today—authors, translators, editorial staff—have personally witnessed the founding period. In the current “Focus” (p. 16–29), Herwig Kempinger therefore rekindles the positive zeitgeist and general creative spirit that ultimately laid the foundation for the magazine’s first issue (see also the message from founding editor Carl Aigner, p. 11). As a media artist who has accompanied us from the very beginning and for whom photography has been an elementary starting point of his own work, Kempinger recalls some of his personal “predilections” from the scene at the time on the basis of hand-picked photographs from the 1980s and early 1990s, more than a few of which have since become icons of photography. We hope you enjoy this journey through time, and we look forward to seeing you in the here and now and as readers of all the issues of EIKON that are to be published after this, the 95th issue!